The Fujitsu Lifebooks are ultra-small and powerful computing with performance optimized technologies that are also more environmentally responsible. It has integrated GPS Navigation capability to locate where you are or where you want to go. The Fujitsu Lifebooks are truly the ultimate notebook for the busy traveler. You can watch downloaded movies, listen to MP3 files, play games, browse the Internet, take pictures and more. 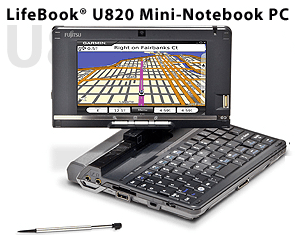 Some come with integrated GPS Navigation capability, These Fujitsu Lifebooks can locate where you are or where you want to go. Garmin Mobile PC software is packed with preloaded maps, millions of destinations (POIs), that gives you turn-by-turn directions and route planning for full GPS navigation capabilities.